Google Friends – our account execs from Google flew down to meet with us! One of the perks of being a ‘Google Certifed Adwords Companies’, Google is making sure that we are on top of the industry and bringing all our clients the latest in innovation. More WyseGuys! TechWyse has been actively recruiting in both of its locations and has managed to secure some new top level talent including a new creative director, a new creative designer, 2 search engine optimization analysts, a new php programmer and will be adding about 6 more members to the team in the coming months! Partnerships – TechWyse has formed 2 new partnerships this month. We are now proud to offer one of the most dynamic Email Newsletter programs in the business, and also have formally launched our Live Chat tool for several clients. Anyone interested in either of these should contact your account manager or email sales@techwyse.com. 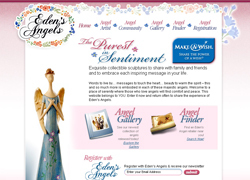 www.edensangels.com – a presentation piece website for a unique product line. Includes a dynamic photo gallery and location search tool. 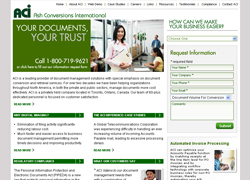 www.ashconversions.com – a document management company. 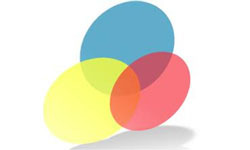 www.accoladedental.com – not just a picturesque view anymore — now also a great website to match! As part of our ongoing company mandate, expect lots from us in the coming months in terms of building upon our current resources and launching many new tools that will help your online marketing endeavors. For anyone requiring more information, please do not hesitate to contact any one of our account management team (or me personally!) by writing to am@techwyse.com or 1.866.410.7090. It’s really cool to see a site from it’s inception all the way to almost 7 years in the future! This is like looking at a blueprint for success in internet marketing. It also shows the amount of perseverance and work needed to get on top of your game! Congrats! I have come across more recent articles by Techwyse. A person looking at this website today may not realize the evolution the site has gone through. Seeing some of your older articles led me to learn more about this website in its earlier years. I guess, this shows that with time valuable things may become even more valuable. Patience also seems to be an important quality. This quality can help webmasters give their site some time for them to grow. Thanks for the kind words @Tikoun! We are definitely evolving more each day, with each new client and new product, we strive to achieve more. Certainly some food for thought here. I’ll have to take a look at my search engine marketing mix and see how I measure up.